I learned this technique from a landscape photographer who is a true expert in post-processing. Although this is an easy technique to explain and master, it is extremely useful. It is fairly common in landscape photography to post-process the sky differently than the foreground. For example, many landscape photographers like their skies darkened. It is also common to add sharpening to an image, which gets applied to edges. Both of these techniques, and especially when used together, can cause “halo’s”… or light lines that run along a transition zone, such as a horizon line or along the top of a mountain. I see these halo’s all the time. They look bad, especially if you enlarge your image, such as for print. Below is what one looks like. 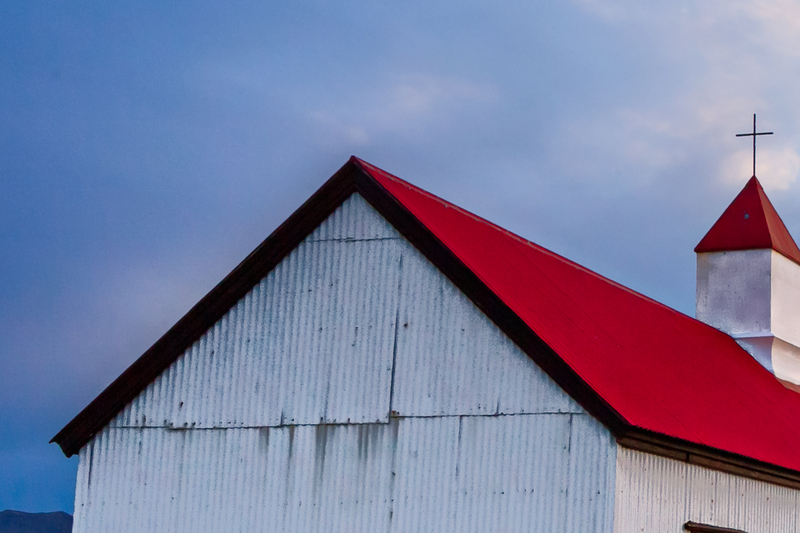 You might have to look carefully, but there is a white line along the top of the red roof. It is even more pronounced on the left side of the chimney just under the red roof. Fortunately, halo’s are very easy to fix using a clever technique in Photoshop. To start out, you need a “pixel layer”, rather than an adjustment layer, at 100% opacity on top. 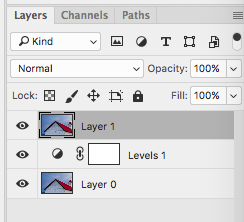 Let’s say that our layer stack looks like this… just the pixel layer and an adjustment layer on top. Because you need a 100% opacity pixel layer on top, we will next do a “stamp visible”, which is a new layer that is a picture of all the other layers as they appear. On a Mac, you hit “Cmd-Opt-Shift-E”. With Windows, you hit “Shift-Ctrl-Alt-E”. 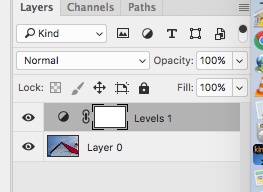 You’ll then see a new layer appear on top of your layer stack. Switch the mode of the Clone Stamp Tool to “Darken”. This is done using the pull-down box that you should see above your image after you have activated the tool. There is a good chance that it is currently set to “Normal”. Change it to “Darken” mode. Next, make sure that the Opacity and Flow of the Clone Stamp Tool are both set to 100%. Lastly, make sure that the hardness of the brush is set to 0% and is a relatively small brush. You have probably used the Clone Stamp Tool before, so I will not go into detail here on that. You simply alt-click on a source area and then brush over the destination area with the tool. The pixels in the destination area are replaced with the source pixels. With Darken mode, however, only the pixels that are LIGHTER than the source pixels are replaced. Anything darker or exactly the same luminosity level is level alone. Halo’s are usually brighter than the surrounding pixels. So, by clicking in a nearby spot in the sky and dragging your cursor over the halo, the brighter halo is replaced but the surrounding area (in this case the sky and the red roof) is left alone. Although difficult to see, the halo in the next picture is gone. This took me less than one minute. After you have finished, it is a good idea to switch your Clone Stamp Tool mode back to Normal so that you do not forget and are confused later why it does not appear to be working (the voice of experience talking). 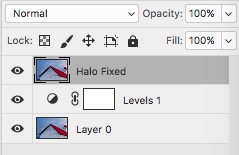 Also, it is a good idea to rename your layer something like “Halo Fixed” so that you can tell later what the purpose of the layer is. It might be difficult to see the modification to the layer and you might inadvertently delete it if it is not re-named. Although it is a near-perfect solution, you might run into some cases where it requires a little more precision. For example, if the clouds have texture and differing brightness levels, then you might run into cases where your destination pixels adjacent to the halo are still brighter than the source pixels. When this happens, it helps to run the clone-stamp tool along the edge of the foreground area (such as the red roof in this example) and just let the edge of the brush run over the halo without bleeding much into the sky. You might need to go over it a couple of times due to the feathering of the brush. Posted in Processing Tips on May 29, 2017 by Ken Koskela.